Apple typically introduces new Watch bands at the start of the season. It keeps its lineup feeling fresh and gives Watch owners the opportunity to switch up their look without turning to third-party straps. The latest refresh brings new color options for a number of different Watch band styles. The Sport Band, priced at $49, is now available in spearmint, Delft blue, and papaya. The Nike Sport band, also $49, can now be had in black/hyper grape, spruce fog/vintage lichen, and teal tint/tropical twist. 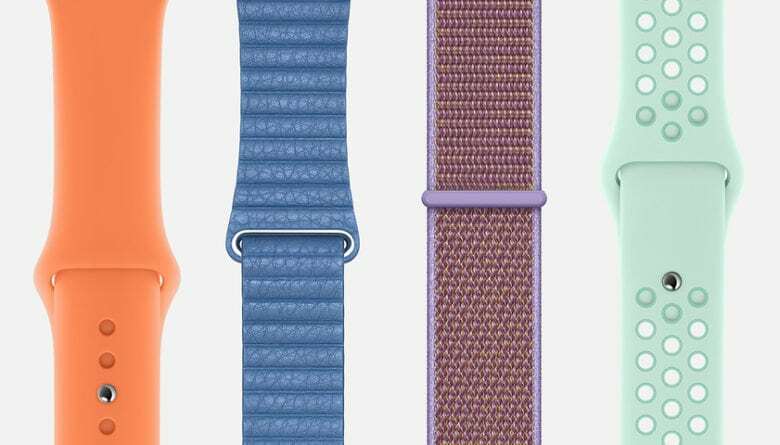 The $49 Sport Loop now comes in papaya, cerulean, spearmint, and lilac. The new, $49 Nike Sport Loop is available in spruce fog, teal tint, hyper grape, summit white, and black. For those who prefer leather, you can now get the $149 Modern Buckle in cornflower, lilac, and sunset. The Leather Loop, which costs the same, is also available in cornflower and sunset. If you have plenty to spend, there’s a brand new Hermès Double Tour available in a number of color options for $489. Apple has ditched a number of other bands to make way for its newest lineup. Mellow yellow, pacific green, hibiscus, and nectarine are among those no longer available when choosing the Sport Band. Nectarine, Cape Cod, hibiscus, storm gray, and indigo are no longer available for the Sport Loop. All of the new styles and color options are available to order today from Apple.com. They should also be available in retail stores by next week, and all are compatible with every version of Apple Watch.